Welcome to our new website, designed by the capable hands of KEITH PHILPOTT. One new feature of this site: we will update on a regular basis, and in some ways it may appear to be a blog as much as it is a catalogue of our publications with Progress Press. If you take a look at the front page, you will see advancing slides that can be advanced manually as quickly as you want to arrow-advance them, or will advance on their own if you want to sit back and take in all the topics for a full view of all the happenings at Progress Press and beyond. You may return to previous slides, or pause, or at any point click the "read more" tab for more information about the title in a particular slide. If we learn of upcoming or recently celebrated events in the lives of our flute friends and colleagues, particularly former students of Walfrid Kujala, we will post these in the form of "EVENTS" with a "READ MORE" tab, and when possible, links to other websites when applicable. We were particularly excited by the release of the second edition of Wally's VADE MECUM in May, 2012. And as special events go, nothing tops the splendor of his retirment concert at Northwestern University on June 4, 2012. These two events consumed most of the front page space of our website, as well as advertising, perhaps to the neglect of our other titles and slightly less spectacular events. Somewhat limited in what we can display at one time on the front page, we elected to go with the advancing slide format so that some of our lesser-traffic items can float to the surface from time to time, and enjoy Front Page priority for a little while. We will mix up the order of appearance frequently, so that if you visit often, you will undoubtedly be familiar with all of our titles. RANDAL HUISKENS provided the stunning artwork that supported our previous website, and Randal maintained the site on a timely manner when I took the initiative to make changes. To Randal, our deepest gratitude for launching our first site over a decade ago. Direct-mail advertising was my first marketing approach. However, compiling a comprehensive mailing list of flute afficionados was no easy task. At that time the only organization able to provide a mailing list of flutists was the College Music Society. CMS publishes an annual directory of music faculties of all the colleges and universities in the USA, and from this directory they can extract and sell mailing lists customized to individual instruments and music disciplines. Their flute teacher list proved to be an important resource. From these initial CMS contacts and a rapidly growing word-of-mouth phenomenon, individual sales of The Flutist's Progress grew steadily, enabling us to gradually venture into other publications such as the Gordeli Concerto, the Elliot Snake-Charmer, my Vade Mecum of Scales and Arpeggios, and the Steve Kujala Eurhythmionics. Many other projects are now in the preparation phase. Most of our sales currently are to large dealers like Flute World, Eble Music, Southern Music, Sheet Music of Portland, Northern Music, and to university bookstores. 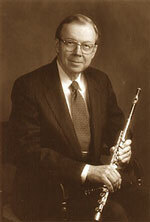 It is gratifying to note that since the founding of the National Flute Association in 1973, Flute Talk magazine in 1981, and the Internet in 1989, all of us music publishers and flute/piccolo makers now have much more effective ways of promoting our products through well-targeted advertising and mailing lists. We are happy to be launching the new version of our website, designed by KEITH PHILPOTT, who walked us through the process of making this site more interactive and dynamic as we see needs for changes and updates. Changes may occur daily, so stay tuned, and enjoy the new features.